Some violinists impress by a dazzling technique, as flawless and polished as a diamond. Some impress by the intensity of their vision, their genius for saying something fresh with a musical phrase that the listener may have heard a thousand times before. Others by their daring, their willingness to push themselves beyond the boundaries of safety - perhaps by choosing an audacious tempo, or by producing some extraordinary and startling tone-color. 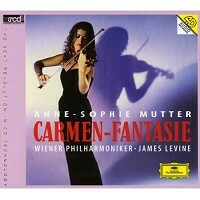 Anne-Sophie Mutter does all of this and more. Just turned 30, she has been holding the world's music lovers mesmerized for 17 years, since she was "discovered" as a child prodigy by Herbert von Karajan.